Just as the strawberry moon peeked up from the horizon, I was leaving the gym, pleasantly surprised to find a pop up market in the parking lot. Baskets of early season tomatoes and squash, tiny eggplant and peppers, and beautiful heads of leaf lettuces covered three tables beneath a canopy. My eureka sense took over. Ratatouille! Growing up in the kitchen, I watched my mom and sister labor over this classic French vegetable stew and I would have no part of it. I deprived myself of the delicacy until my second baby was born twenty years ago. My sweet neighbor Claudia delivered dinner for our family -- I can still hear her saying, “It’s nothing fancy, just a roast chicken and potatoes, and some ratatouille.” My grown up palate devoured the silky vegetables and I was forever converted. Flash ahead to 2007 and this dish stole the hearts of all with the animated film Ratatouille. starring an adorable rat residing in a famous restaurant in Paris. The plot is much thicker than even a pot of succulent vegetable stew and has a fitting denoument. Children across America fell in love with the darling rat, Remy and this ornate collection of summer vegetables. Julia’s version is a pot brimming with fall-apart tender vegetables. The animated dish deconstructs it into art. I created my own version with my haul from the pop up market. Happy Cooking! classically made on the stove top, here I arrange the sliced vegetables in a ceramic pie pan and roast it in the oven. Simple and delicious! Heat the oven to 375. Toss the tomato and garlic together in a glass or ceramic pie pan and add 1 teaspoon of fresh thyme leaves, 1 tablespoon olive oil, and 1/4 teaspoon salt. Spread across the bottom of the pan. Combine the sliced zucchini, yellow squash, and eggplant in a medium bowl and drizzle with 2 tablespoons olive oil and add the remaining 2 teaspoons fresh thyme. Toss to lightly coat the vegetables, then sprinkle in 1/2 teaspoon salt and 1/4 teaspoon pepper. Arrange the vegetable circles on top of the tomatoes in the dish, alternating to make a pretty pattern, if desired. Sprinkle with the sliced bell pepper and drizzle the top with the remaining 1 tablespoon olive oil and a final sprinkle of salt. Roast in the oven until vegetables are tender and just beginning to brown on the edges, about 40 minutes. Let cool slightly before serving. The MOST exciting thing happened while I was cooking outdoors at Capitol Market, Charleston, West Virginia’s year-round farm market (think San Francisco’s Ferry Building scaled down in a small town train depot). I got to practice my French, saying "Laissez les bon temps rouler," as the sugar, butter, and pecans bubbling on my cooktop perfumed the air. In the distance, a brass band was trumpeting a medley of classic horn tunes, concluding with what felt like a serenade of When the Saints Go Marching In. Was I dreaming? A full house for the cooking demo on this bluebird day, perfected by a subtle breeze and the festive parade passing through. Let the good times roll! 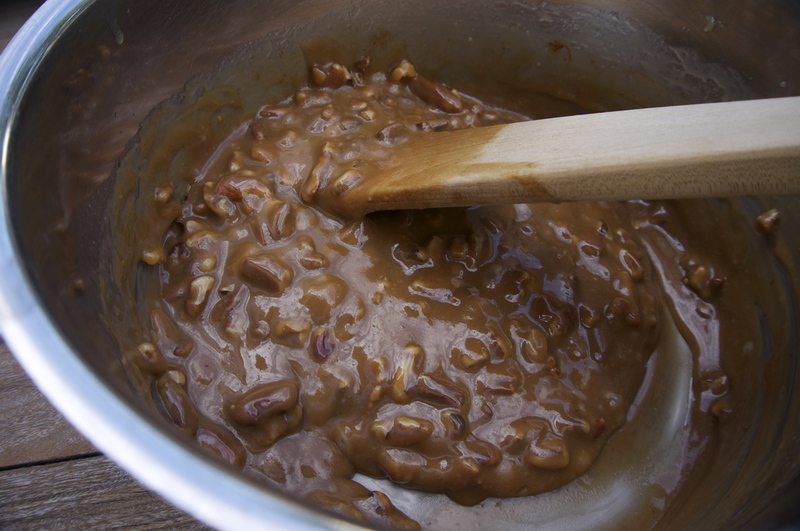 Drop spoonfuls of the praline syrup onto the parchment-lined baking sheet, working quickly before the mixture sets up in the saucepan. Let the pralines cool and harden for 10 minutes before serving. Store in an airtight container layered between sheets of wax paper.